Dagenais, Maxime. "Quebec Act". The Canadian Encyclopedia, 24 May 2018, Historica Canada. https://www.thecanadianencyclopedia.ca/en/article/quebec-act. Accessed 22 April 2019. 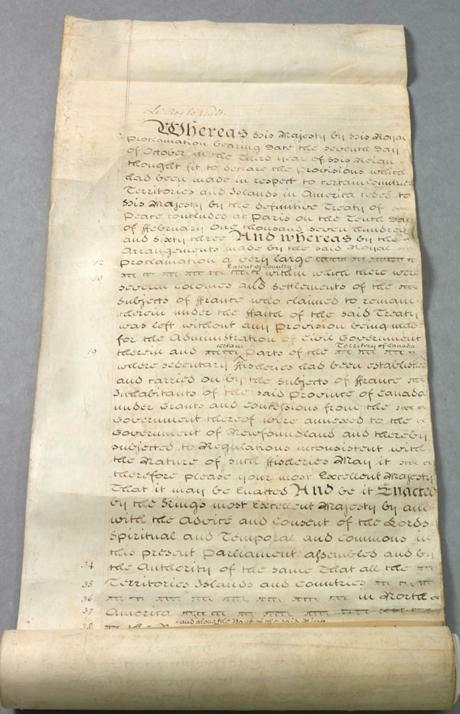 Royal Assent on 22 June 1774 and put in effect on 1 May 1775, the Quebec Act (An Act for making more effectual Provision for the Government of the Province of Quebec in North America) revoked the Royal Proclamation of 1763. Contrary to the proclamation — which aimed to assimilate the French Canadian population — the Quebec Act was passed to gain the loyalty of the local French-speaking majority of the Province of Quebec. Based on the experiences of Governors James Murray and Guy Carleton, it, amongst other things, guaranteed the freedom of worship and restored French property rights. The Act, however, had dire consequences for Britain’s North American empire. Considered one of the five “Intolerable Acts,” the Quebec Act was one of the direct causes of the American Revolution. It was followed in 1791 with the Constitutional Act. 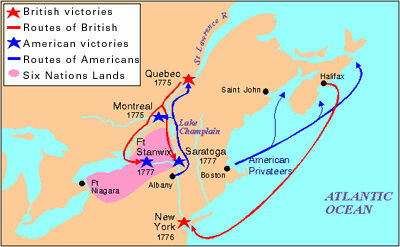 In 1763, after a century of imperial warfare in North America, which included a decisive British victory at the Plains of Abraham, France ceded much of its North American territory, including Île Royale (Cape Breton Island), Canada and its holdings in the Great Lakes Basin and east of the Mississippi (except New Orleans), to Great Britain with the signing of the Treaty of Paris (see also Conquest). Subsequently, the Royal Proclamation (also adopted in 1763) integrated these new territorial gains and its people into Britain’s North American empire. Generally, the Royal Proclamation aimed to assimilate the local French-speaking population. Predicting a massive influx of English-speaking Protestant settlers, English laws, customs and practices were established in the colony. In time, the local French-speaking population was expected to assimilate in order to survive. This also created an environment in which British merchants gained a stranglehold on the colony’s economy, particularly the fur trade. In practice, however, things were very different. Since English-speaking immigrants were not arriving en masse, Governor James Murray realized that assimilation was impractical: French speakers outnumbered English speakers and Murray depended on their cooperation to govern. As such, though he introduced English criminal law, he retained French property and civil law. According to historian Donald Fyson, French-speaking Catholics even held public offices. 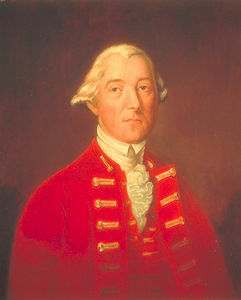 Portrait of General James Murray by an unkown artist, circa 1770-80, oil on canvas. 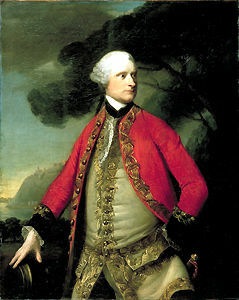 The Englsih merchants had Murray, the first governor of the Province of Québec, recalled. The dispute centered on the application of British law and the creation of an Assembly (courtesy National Portrait Gallery). In February 1774, Alexander Wedderburn, the Solicitor General for England and Wales, began working on an act to replace to the Royal Proclamation. He was assisted by Lord Dartmouth, the Secretary of State for the Colonies, Governor Guy Carleton, William Hey, the Chief Justice of the Province of Quebec, Lord Hillsborough, the former Secretary of State for the Colonies, Lord Mansfield, Lord Chief Justice of the King’s Bench, and Attorney General Edward Thurlow. Lord Guy Carleton was largely responsible for the Quebec Act, which helped to preserve French laws and customs (courtesy Library and Archives Canada/C-2833). Carleton therefore argued that maintaining local French Canadian customs was a much more practical option and spent years convincing British officials to abandon their assimilationist policies. Add to that the growing tensions in the Thirteen Colonies during this period, and the fear that French Canadians might join a potential revolt, it was imperative that Britain gain the loyalty of the French Canadian population. From a geographic perspective, the Quebec Act once again divided the North American territory. The Province of Quebec was significantly enlarged. No longer limited to the St. Lawrence River Valley, the province’s borders expanded to comprise Labrador, Anticosti Island, Magdalen Islands and a large area to the west of the Thirteen Colonies, including what would become Southern Ontario, the disputed territory of Ohio, Michigan, Indiana and even parts of modern-day Wisconsin, Illinois and Minnesota. This territory also included what was then called the “Land of the Indians” that the Royal Proclamation had recognized as Indigenous reserves. The proclamation had banned European settlement on this territory. According to Alan Taylor, the idea was that “Quebec’s authoritarian government” could better prevent the arrival of settlers and land speculators from the Thirteen Colonies onto this land. The Quebec Act was intended to appease and gain the loyalty of French Canadians. First and foremost, the Act granted the freedom of worship in the colony. As such, French Canadians could freely practice their religion: Roman Catholicism. This was quite a contrast with the manner the British government had traditionally handled similar situations; it had, for the last 200 years and particularly in Ireland, adopted antipapist approaches. In Quebec, it adopted a completely different attitude, recognizing the distinct realities of the colony. As a result of freedom of religion, French-speaking Catholics were no longer barred from running the affairs of the colony, so long as they agreed to take an oath of allegiance to the king, which unlike the previous Test Act, made no mention of one’s religious affiliation. Though English criminal law was retained, the act restored French civil law. This meant that the Roman Catholic Church was now legally entitled to collect the tithe and the seigneurial system was re-established. While the seigneurs and church officials were undoubtedly happy, French-speaking inhabitants were surely less enthusiastic about having to pay seigneurial dues and taxes. The Act also revoked every ordinance that passed between 1764 and 1775, their legality questioned by politicians and lawmakers. As stated by the Royal Proclamation, legislative authority could only be held by the governor, his council, and the assembly. And since an assembly was never established, colonial authorities did not have the power to impose taxes or duties. To English-speaking colonists, especially the men of the “British Party,” the Act was not something to celebrate. These men — most of whom were merchants living in Montreal and Quebec City — wanted to assimilate the French-speaking population. They hoped to turn the colony into a proper British colony. 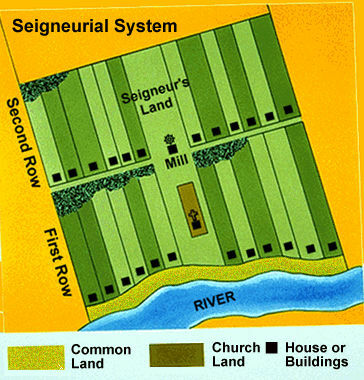 They sought the establishment of the English common law system and freehold tenures instead of the seigneurial system. Moreover, they desired an elected assembly under the control of the British Party and argued that only English-speaking Protestants should be able to vote or hold public office, and even unsuccessfully petitioned in favour of it. British officials rejected these demands — fearing that a British-dominated assembly would cause tensions within the colony — leading historian Alan Taylor to conclude that “Quebec presented a paradox where a British minority resented that imperial officials protected the culture and law of the French majority.” Instead, a Legislative Council of 23 would be appointed by the Crown to govern the colony with the governor. Nevertheless, the expansion of the colony’s territory surely pleased many British merchants, as it significantly increased their commercial territory. Perhaps the most important consequence of the Quebec Act was the American War of Independence. To many settlers in the Thirteen Colonies, the Quebec Act was a very unpopular act and a demonstration of “British Authoritarianism.” It was famously one of the five “intolerable acts” passed by Britain in the lead-up to the revolution. One month before the Quebec Act passed, the British Parliament approved a series of acts that angered the population of the Thirteen Colonies: the Boston Port Act, an Act for the Impartial Administration of Justice, Quartering Act, and Massachusetts Government Act. These “intolerable acts” were heavily condemned as unjust and despotic. The Boston Port Act, for instance, shut down the city’s port until locals paid for the tea that was destroyed during the famous Boston Tea Party; the newly amended Quartering Act now allowed authorities to lodge British soldiers in private homes; and the Massachusetts Government Act turned, amongst other things, the elected colonial council into an appointed one and banned all town meetings taking place without the consent of British officials. During the Revolutionary War, two invasion forces were sent to Canada to recruit locals in the fight against the British. Led by Colonel Benedict Arnold and General Richard Montgomery, these failed as a result of difficult conditions, a lack of supplies and a general lack of support from the local population (see American Revolution – Invasion of Canada). The Quebec Act was followed in 1791 with the Constitutional Act. Much had changed since 1774, as thousands of Loyalists — seeking refuge in the wake of the American Revolution — arrived in the Maritimes and in the Province of Quebec and settled north of the Great Lakes. Arriving in a British colony with foreign (French) property and civil laws and without proper British representative institutions, these Loyalists began pressuring British authorities to establish English common law and a proper legislative assembly. On the other hand, French Canadians feared that the increasing number of Loyalists would result in the loss of the rights they had gained through the Quebec Act. 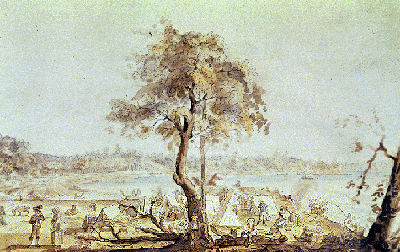 One wave of Loyalists came up the St Lawrence River in 1783 to Lake Ontario, where their encampment grew into the town of Kingston. Drawing by James Peachey. The 1791 Constitutional Act was a compromise. The Province of Quebec was divided into two: the colonies of Upper Canada and Lower Canada. Upper Canada, where the majority of Loyalists had settled, adopted English common law, while Lower Canada, where the majority of French Canadians resided, retained French property rights and all of the privileges that French Canadians had gained in 1774. Both colonies also benefited from some political representation with the establishment of separate, elected Legislative Assemblies. Raymond Blake, Jeffrey Keshen, Norman Knowles, and Barbara J. Messamore, Conflict and Compromise: Pre-Confederation Canada (2017). Vernon P. Creviston, ““No King Unless It Be a Constitutional King”: Rethinking the Place of the Quebec Act in the Coming of the American Revolution.” The Historian 73.3 (2011): 463-479. Richard A. Primus, The American Language of Rights (1999). Alan Taylor, American Revolutions: A Continental History, 1750-1804 (2016).